See how you can use Catch the Best to manage your resume workflow. Seeing how the members of your team are ranking the applicants as they come in is definitely better than having all those resumes in your inbox. Ready to vote a particular candidate up or down? Just click thumb-up or thumb-down and record your opinion. Viewing a candidate’s detail page gives you easy access to the candidate’s cover letter, resume, and contact information. Quickly cast or change your vote. Send the word out to your team mates to check out this applicant, send an email to the candidate (which gets added to the attached comments), or archive a candidate who is no longer being considered for the position. Download the candidate’s resume or other attachments, or view them right on the page via the embedded Scribd viewer. 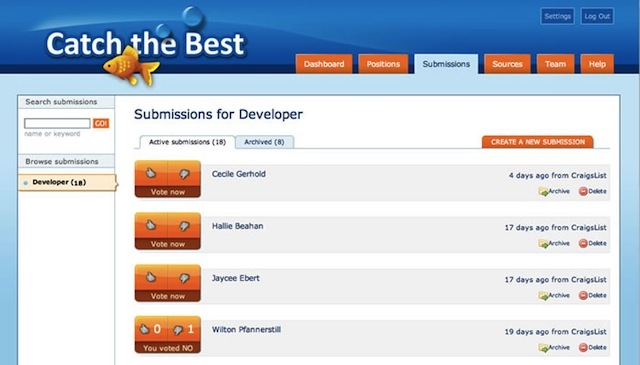 All the comments and votes recorded about a candidate are attached to the candidate’s profile for easy review. 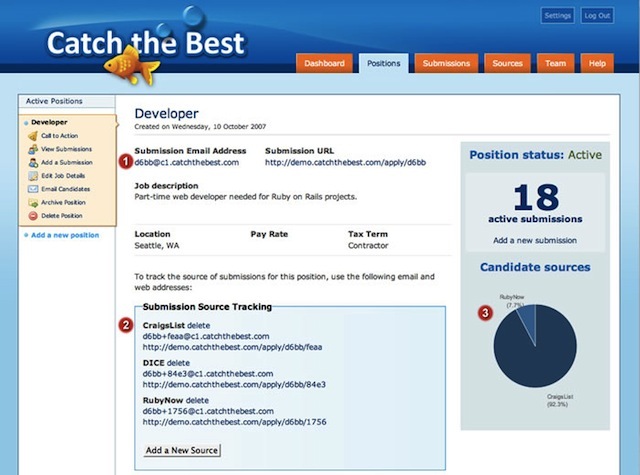 The position overview page shows you how many submissions are active for the position, where the job applicants are coming from, and the details that are being displayed to job applicants that apply through the web interface. Each position has its own unique submission email address and web address that you can use when posting your job ad. The job description, location, etc., are displayed to job applicants when they apply via the web address. It’s easy to find out exactly which job boards are sending you the best candidates. Quickly create unique email addresses and web addresses with tracking tokens to accurately track which source sent you a particular candidate. As applications come in, you can see at a glance which job ads are sending you the most traffic. The most highly-ranked candidate for each position shows up on your dashboard. Get a quick overview of the recent activity for your jobs. You can host your job site on Catch the Best, complete with your own styling (logo, colors, and so on). Your active jobs will automatically be listed on the site as you add them.